This report provides a new detailed quantitative assessment of the consequences of climate change on economic growth through to 2060 and beyond. It focuses on how climate change affects different drivers of growth, including labour productivity and capital supply, in different sectors across the world. The sectoral and regional analysis shows that while the impacts of climate change spread across all sectors and all regions, the largest negative consequences are projected to be found in the health and agricultural sectors, with damages especially strong in Africa and Asia. The OECD Environmental Outlook to 2050: Consequences of Inaction took no account of the feedbacks from environmental challenges and resource scarcity to the economy. 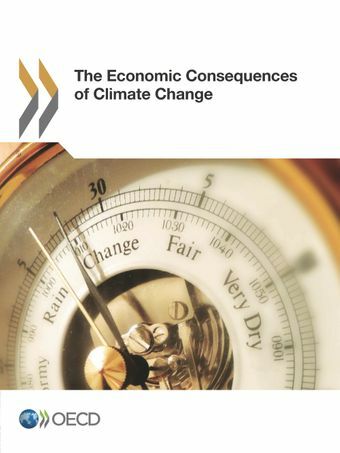 This report seeks to address this gap through a detailed economic modelling framework that links climate change impacts to specific aspects of regional economic activity, such as labour productivity, the supply of production factors such as capital, and changes in the structure of demand. This detailed global analysis, which covers a wide range of impact categories including agriculture, coastal zones, some extreme events, health and energy and tourism demand, is used to assess the economic consequences of climate change until 2060, and is complemented by more stylised integrated assessment modelling of post-2060 economic impacts. The Economic Consequences of Outdoor Air Pollution (2016) provides a comprehensive assessment of the economic consequences of outdoor air pollution in the coming decades, focusing on the impacts on mortality, morbidity, and changes in crop yields as caused by high concentrations of pollutants. Unless more stringent policies are adopted, findings point to a significant increase in global emissions and concentrations of air pollutants, with severe impacts on human health and the environment. The market impacts of outdoor air pollution are projected to lead to significant economic costs, which are illustrated at the regional and sectoral levels, and to substantial annual global welfare costs. Further degradation of the environment and natural capital can compromise prospects for future economic growth and human well-being. The OECD Environmental Outlook to 2050: Consequences of Inaction (2012) projected significant consequences of climate change, biodiversity loss, water scarcity and health impacts of pollution by 2050, unless more ambitious policies are implemented. The Environmental Outlook, however, presented a one-way analysis of the impacts of socioeconomic developments on the environment. Specifically, it took no account of the feedbacks from environmental challenges and resource scarcity to the economy. To receive our latest Environment news, publications and events, sign up to MyOECD.